The Russian Foreign Ministry has received a note from the Ukrainian government expressing its readiness to accept the Russian humanitarian aid. 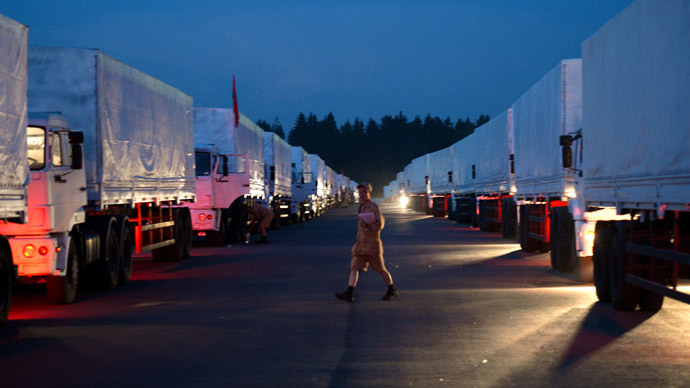 The news came as Moscow agreed on the Ukrainian presence in the humanitarian convoy. The trucks are carrying food, medication and drinking water. Earlier, a spokesman for the Ukrainian military said that Kiev intended to hold up the internationally-supervised aid convoy meant for the Ukraine's east for at least a week. Ukraine said the time was needed for the International Committee of the Red Cross (ICRC) to establish where exactly the aid should go. Meanwhile, Ukraine has abandoned the idea to reload the aid from Russian trucks onto Red Cross transport after a search at the border, according to Lavrov said. 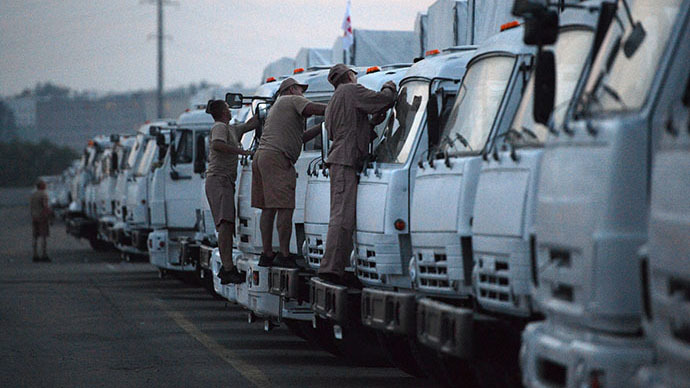 “They raised the question of reloading the aid from all 287 trucks onto the trucks rented by the Red Cross, but, for obvious reasons, abandoned this idea, because it would only complicate and make the implementation of this humanitarian action more expensive,” the Russian FM said. “I count a lot on the hope that public statements made by some Kiev authorities with the demand for new conditions will be disavowed and won’t interfere with the accomplishment of the agreements reached between Russia, Ukraine and the Red Cross,” he added. Lavrov stressed that Kiev is guaranteeing the safety of the convoy. “We firmly rely on the assurances by the Ukrainian authorities. They are guaranteeing the safety of the whole convoy’s movement on the territory controlled by the Ukrainian special forces,” he said. “We expect the self-defense forces to express the same attitude toward this humanitarian action. I’m sure there’ll be no breaches, as they are now on the territory, the residents of which require badly humanitarian assistance,” Lavrov stated. Earlier Tuesday, the Ukrainian government in Kiev announced that it would hold up the humanitarian convoy for at least a week, in order to give time for the International Committee of the Red Cross (ICRC) to establish where the aid should go. However, Russia’s Emergencies Ministry said that the destination for the Russian humanitarian aid will be determined jointly by Moscow’s representatives, the International Committee of the Red Cross and the Ukrainian government. Andrey Lysenko, the spokesman for Ukraine’s National Security and Defense Council, claimed that the convoy consisted of repainted military trucks and was accompanied by an S-300 air defense system, according to the news agency Ukraine National News. On Tuesday, the eastern Ukrainian city of Lugansk, one of the biggest regional centers, declared a state of humanitarian catastrophe: there are no medical supplies, electricity or lighting. There is also a lack of mobile and internet communication. Some 250,000 civilians are unable to leave, a statement on the city council’s website said. A total of 117,000 people are internally displaced in Ukraine, according to the latest UN data, and around 730,000 people have reportedly fled to Russia. The truth about events in eastern Ukraine has started to appear in the Western media, Lavrov said, and thanked Russian journalists for the contribution they have made in covering these events. “Western media are beginning, although unwillingly, to cover the situation in detail, showing all the horrors experienced by the civilian population,” Lavrov said.